This one is going to be a short one, but boy is it a weird one. and many real life people love to claim that our lives and fortunes are at the whim of the “invisible hand of the market”. Yes, the hand is always there. It’s big, it’s powerful, and it’s completely unknown to we small pathetic creatures. 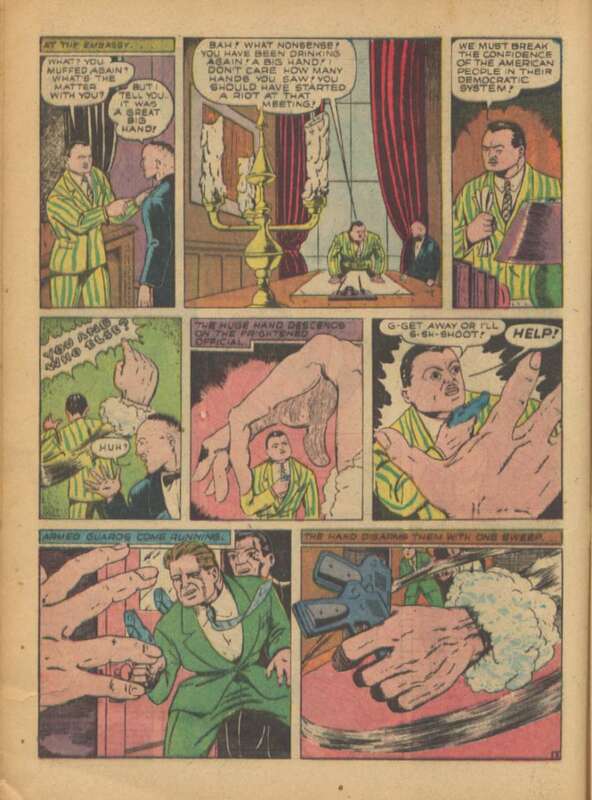 But did you know that someone tried to take this idea of “The Hand” and turn it into a superhero in the 1940’s? Told you this was going to be weird. 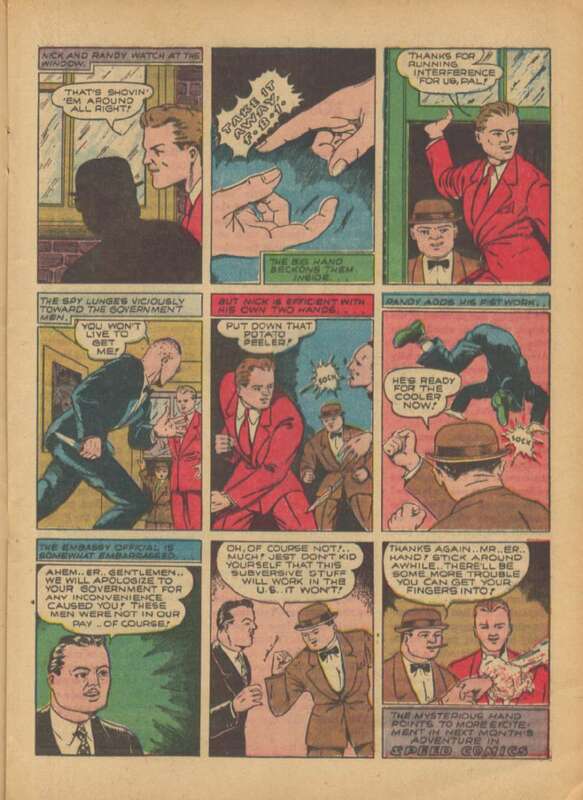 The Hand made his first appearance in Speed Comics #12 in 1941. 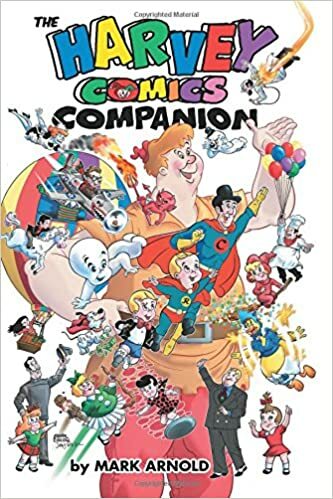 The comic series was the first comic book title published by Harvey Comics, a relative newcomer to the comic book scene and a company that would become famous for licensed titles such as Caspar the Friendly Ghost and Richie Rich. 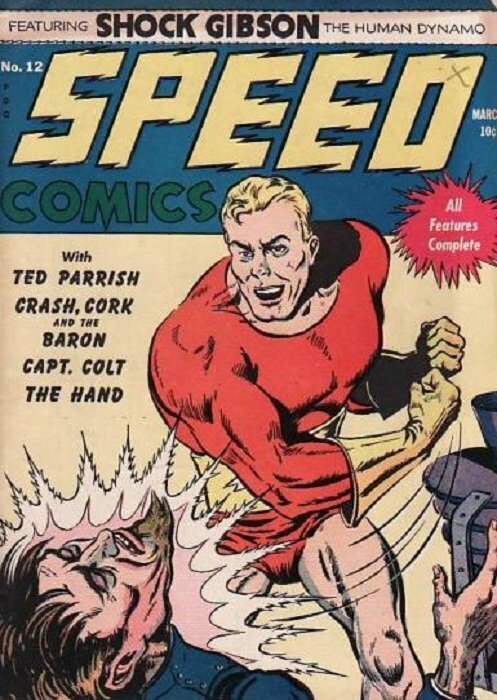 Fun fact: Speed Comics had been bought from a struggling publisher called Brookwood Publications and was Harvey’s entry point into comic book publishing. Without this title, Harvey wouldn’t go on to become a major comic book publisher. 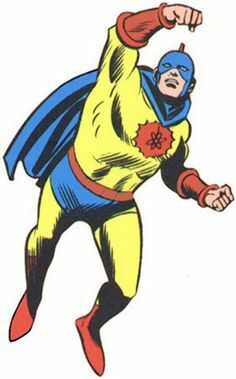 The character of The Hand was created by Ben Flinton and Bill O’Connor, two men who would go on to create the Golden Age version of the superhero known as The Atom. 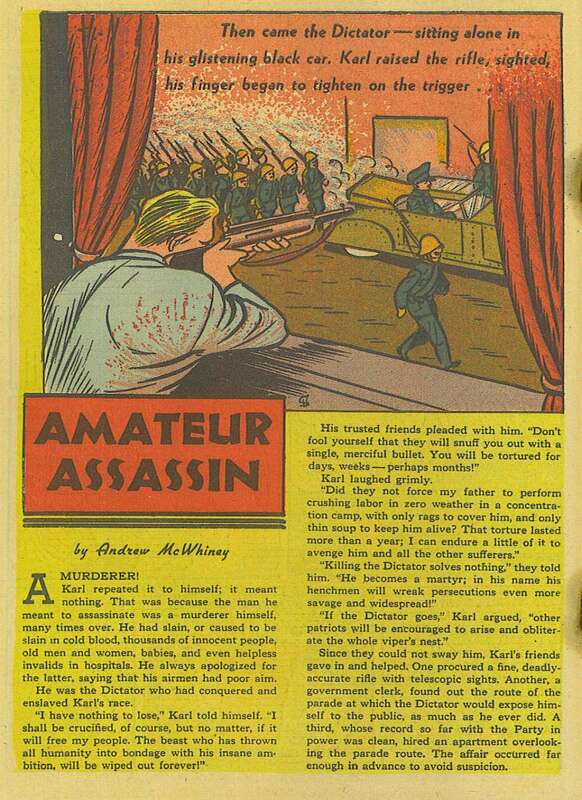 Unfortunately, both men would wind up joining the armed services in 1942, and while both men survived they did not return to comics after that. 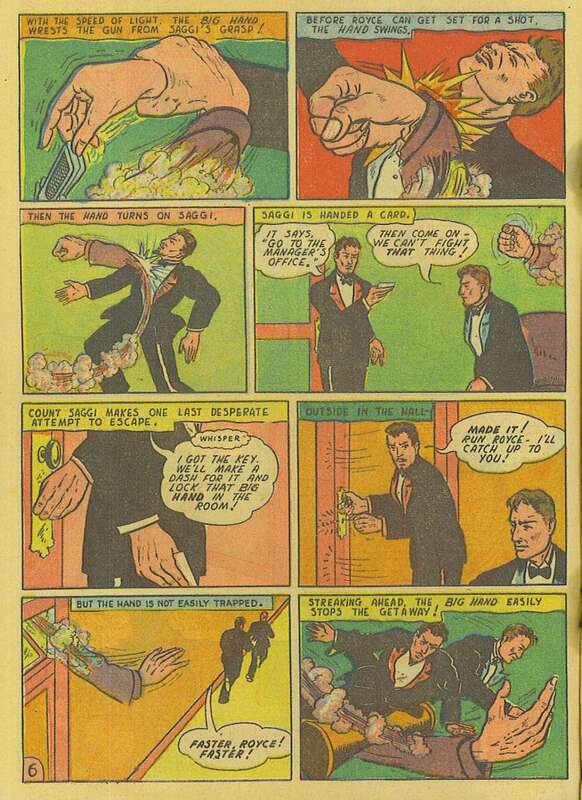 In his first and longest adventure, the Hand doesn’t fight Nazis or stop saboteurs. Instead, he stops a couple of card sharks from ripping off a casino. He is introduced with no fanfare, no explanation, and no backstory. He just appears and warns two men that they better watch themselves. The two men ignore the warning and begin to clean out the house. 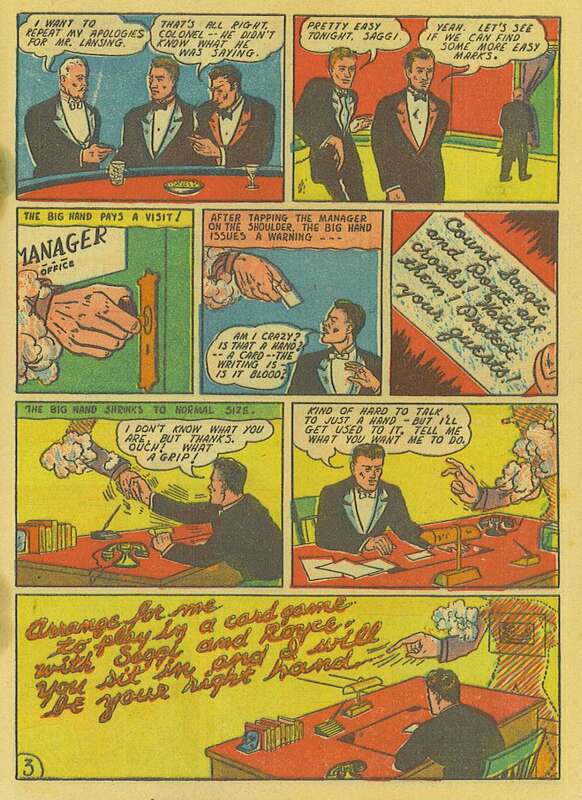 The Hand warns management, who takes it all in remarkable stride and agrees to let the disembodied hand help him. I like to imagine that the hand belongs to some sort of cosmic being that is actually a child and is trying to act all grown up by helping people. Why not? It’s more explanation than the comic gives. The Hand is also a capable fighter…and capable of phasing through walls. However, when the criminals attempt to stop The Hand by confessing, The Hand realizes that they will not be arrested or charged for their crimes. So he brands them on the forehead so the world will know what they’ve done. Apparently, The Hand has never heard of hats. Which kind of makes sense. On a side note: this comic issue deserves special mention for the story that came directly after this one. Since most comics at the time were anthologies publishing short stories of only a couple of pages, we got treated to this one. A kid taking out a head of state with a rifle and people being okay with it? Boy the times really were different back then. 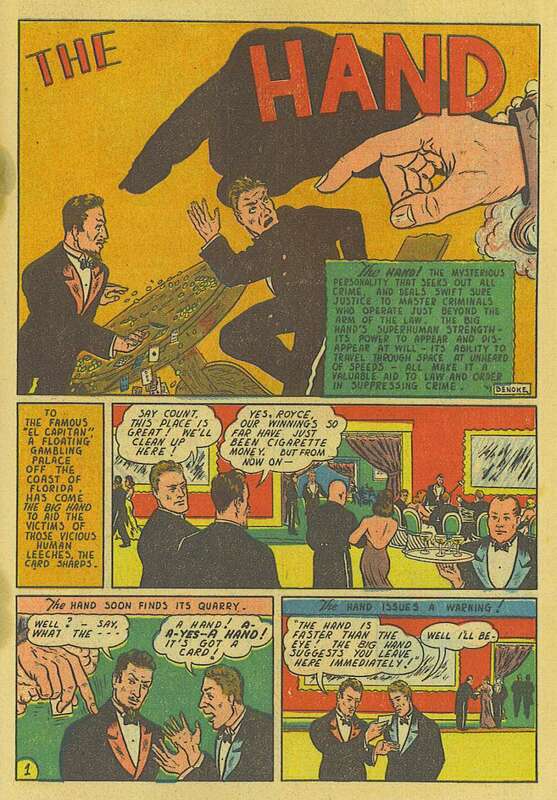 Anyway, The Hand would have one more story in the following issue of Speed Comics where he played the patriotic game and helped the F.B.I defeat some foreign spies. It was shorter, but had more action. 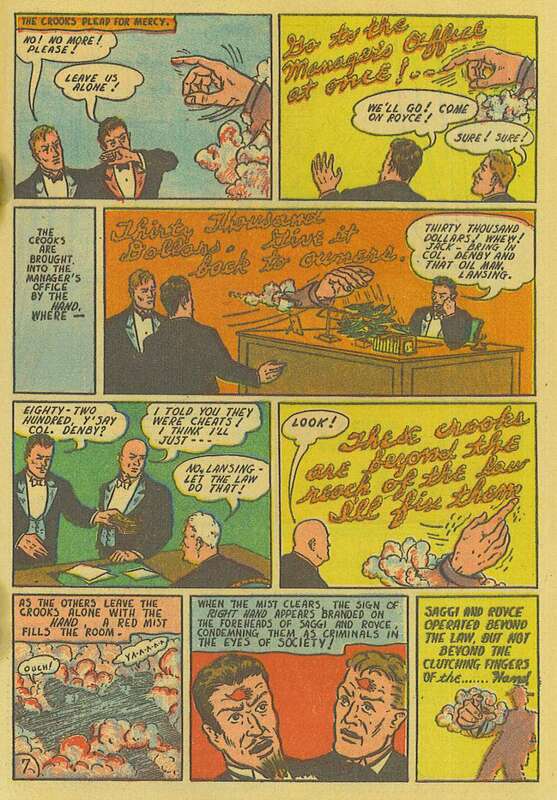 …and that was it, those were the only two issues that featured The Hand as a superhero. It’s really not that surprising really. 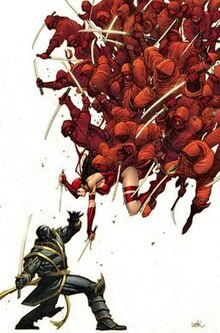 The character was a small backup feature in a series that didn’t last very long and was published by a company that shifted focus away from original characters and into licensed stories. Plus, let’s be honest, the two stories that The Hand appeared in weren’t that exciting or good. The Hand may have been a small time character with boring stories, but that doesn’t mean the concept wasn’t interesting or that he didn’t have any value. Sure, the creature was a hero and had a sense of agency and purpose, but it always had room for normal people to step in and take over when the time was right. It appeared that The Hand was some sort of benevolent spirit who helped where he could and allowed normal people to do the right thing, and if that isn’t heroic I don’t know what is. The Hand had potential, it would be a shame to forget that. This entry was posted in Blog and tagged Atom, bad, comic, comic book, comic book history, comic books, comicbook, comicbooks, comics, crime, criminal, criminals, Daredevil, digits, Elecktra, fingers, funny, Golden, Golden Age, Golden Age of Comics, good, hand, hands, Harvey, Harvey Comics, history, humor, Marvel, Master Hand, Speed, Speed Comics, super, super hero, super heroes, superhero, superheroes. Bookmark the permalink.